Trump will wrap his 13-day tour of Asia with a stop in the Philippines. President Donald Trump will wrap up his 13-day tour through Asia with a stop in the Philippines Sunday and Monday -- a key American ally in the midst of a bloody drug war, dealing with an insurgent ISIS threat and concerned about increasingly stronger ties to America's adversaries China and Russia. But most of all, Trump will have to tangle with the country's controversial president, Rodrigo Duterte, who has a reputation for filthy language, has faced charges of crimes for his drug war, and has claimed several times to have killed people himself. His latest claim came Friday while at a summit with Trump and other leaders, claiming that he stabbed someone "just over a look" and forcing a spokesperson to later clarify it was a joke. Two days later, he will host Trump and other world leaders at the Association of Southeast Asian Nations, or ASEAN, summit, with a 50th-anniversary gala. The next day Trump and Duterte meet one on one. Here are the top issues on Trump's visit. Among Duterte's most infamous comments was what he said about former President Barack Obama. After Obama said he would challenge Duterte about his war on drugs and crime, Duterte ordered Obama not to question him and called him a "son of a whore" in a press conference. Obama canceled the meeting. Duterte's office issued a statement, saying he regretted the comment. But relations were never the same. Trump, on the other hand, has embraced Duterte -- with a senior administration official saying before the trip that "there's a warm rapport there." The two have exchanged letters, and when they spoke by phone in April, the White House said the call was "very friendly" and the president "invited President Duterte to the White House to discuss the importance of the United States-Philippines alliance, which is now heading in a very positive direction." That invitation generated some outrage from human rights groups. But the Philippines is a major non-NATO ally, meaning it has special treaty status with the U.S., and the relationship between the two countries dates back to the 19th century and the Spanish-American War, when the U.S. took control of the islands from Spain. It has been an important buffer against Chinese assertion, especially in the South China Sea. But while the Obama administration refused to look past the alleged human rights abuses, the Trump administration seems to care more about that alliance. 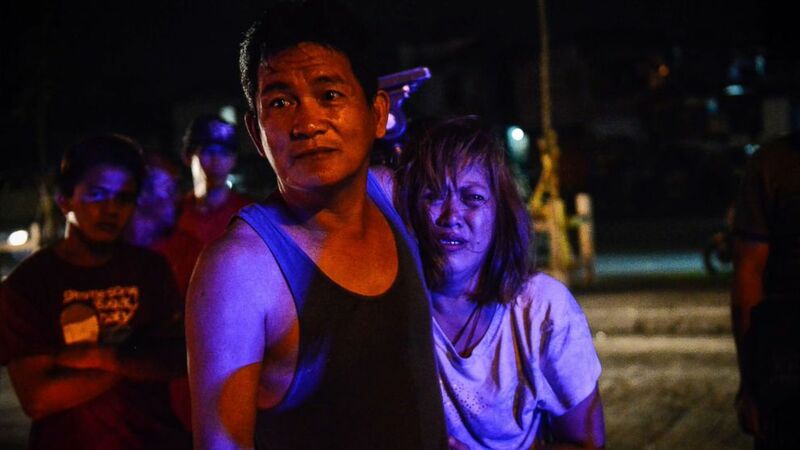 (Ezra Acayan/NurPhoto via Getty Images) The parents of Irish Glorioso weep after learning their son was shot dead by unknown assailants in Navotas, north of Manila, Philippines, June 8, 2017. Drug-related killings continue as President Rodrigo Duterte marks his first year in power. That doesn't mean the issue won't come up. The senior administration official told reporters, "The president will have frank and friendly discussions in his first meeting with Mr. Duterte." The drug war has become an unavoidable topic -- with more than 12,000 people killed, according to estimates by some NGOs and media outlets. When he came into office in June 2016, Duterte ordered the police and military to violently root out criminals and drug users and sellers, but instead of arrests and prosecutions, there were thousands of extrajudicial killings. Over the last year and a half, the violence has snowballed, with an enormous death toll. 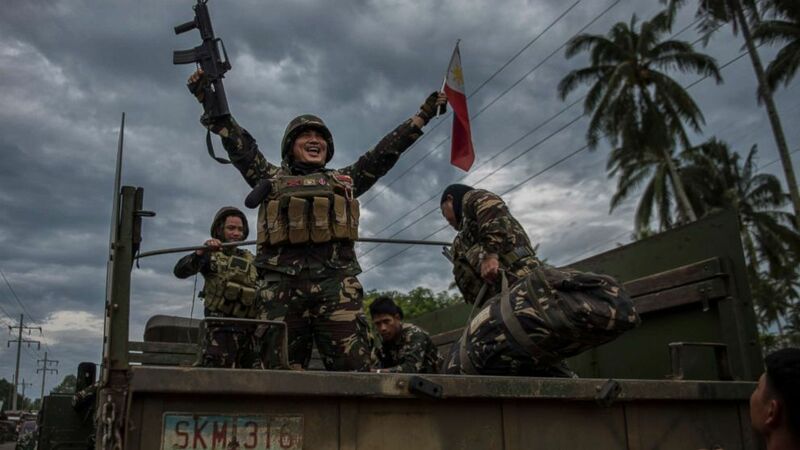 (Jes Aznar/Getty Images) A government soldier waving the Philippine flag as they get ready to leave the battle against IS-inspired militants, Oct. 20, 2017, in Saguiaran town in Lanao del Sur, southern Philippines. Duterte has defended the killings as necessary to "cleanse" the country of a drug scourge and questioned whether or not drug users and dealers are "human" or could be rehabilitated. Trump applauded the efforts as well, saying in a statement in April, "The Philippine government is fighting very hard to rid its country of drugs, a scourge that affects many countries throughout the world." But after international pressure -- including an economic threat by the European Union to strip the Philippines of trading privileges worth billions -- and declining support at home, Duterte scaled back the policy in October. He suspended the Philippine National Police’s anti-drug operations but has allowed the Philippine Drug Enforcement Agency to continue its work. With that curtailment, it seems even less likely that Trump will call on Duterte to suspend operations and seek justice for victims. The Trump administration could announce closer ties to the Filipino military as the country battles an ISIS-affiliated insurgency in a southern province called Mindanao. Long the home to Muslim separatists groups -- including one affiliated with al Qaeda -- insurgent groups announced their allegiance to ISIS in 2014, with ISIS accepting in early 2016. In May, the group mounted a surprise assault on the city Marawi, shortly after the government tried to capture one ISIS group's leader. The terrorists seized government offices, a university and other buildings, took hostages and fought back security forces. For weeks, then months, the two sides fought back and forth, block by block. The U.S. has supported the military's efforts -- as it has for years -- with aid including special operations training and arms sales, but it did not fight alongside Filipino forces. After a five-month siege, the government announced on Oct. 23 that it had retaken the city -- with nearly 800 militants, including top leaders, 158 government soldiers and 47 civilians dead. While the threat of small-scale attacks and bombings remains, as well as unexploded bombs and other weapons, people are finally beginning to return to their lives. But ISIS's hold on Iraq and Syria continues to crumble in recent months, so the group has encouraged new recruits to travel to the Philippines and other countries instead -- and Secretary of State Rex Tillerson said in August that some fighters in the Middle East have traveled to the country. With the danger still imminent, Duterte's government wants more weapons -- announcing an interest in purchasing Russian arms Friday. The Trump administration will likely try to counter that, as it pledges continued support for Filipino efforts to eradicate the terror group.